Ice-strengthened ships manned by experienced personnel have been a cornerstone of our Antarctic operations since 1943. 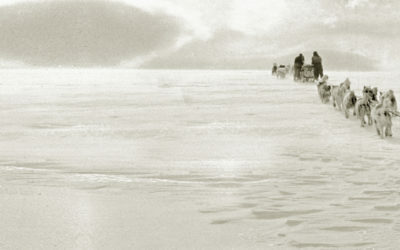 Initially, the role of ships was to establish bases and provide annual relief with staff, supplies and mail, but it also opened up otherwise inaccessible locations to scientific field parties. Ships officers have always carried out a variety of hydrographic survey and sea ice observation work to help with the demanding and at times dangerous task of navigating in icy and poorly charted waters. During Operation Tabarin, 1943-1945, ship support was provided by the Admiralty, consisting of an ice-strengthened Royal Navy-commandeered vessel, a local Falkland Islands supply ship, and an ice-strengthened ship chartered from what was then the Dominion of Newfoundland. In 1947, the newly formed Falkland Islands Dependencies Survey (FIDS) purchased its first vessel, which was named the MV John Biscoe – new polar vessels have been named either after previous polar ships or individuals associated with polar exploration. The organisation’s scientific work was recognised in 1953 by the granting of Royal Research Ship status to FIDS – later BAS – vessels. In 1955 a second ship was bought – RRS Shackleton – and the next year the first purpose-built support vessel, RRS John Biscoe, replaced her ageing namesake. Charter vessels continued to be used as required until 1970, when the newly built RRS Bransfield replaced the RRS Shackleton. In 1978/79, in response to growing demand for deep-sea research, the RRS John Biscoe was extensively re-fitted for the study of physical oceanography and marine ecosystems. She was replaced in 1991 by RRS James Clark Ross, the first BAS vessel purpose-built as a science platform. When RRS Bransfield was sold in 1999, logistical support was taken up by RRS Ernest Shackleton, operated by BAS on a long-term charter. Since the 2000s both vessels have undertaken work in the northern hemisphere during the Antarctic winter season. In the future the functions of both BAS ships will be combined in the new NERC polar research vessel, the RRS Sir David Attenborough, due for launch in about 2020. Interestingly, plans for a single-ship operation were being developed in the 1979-81 period when BAS was facing considerable financial cutbacks, but were made redundant by budget increases following the South Atlantic conflict. The Royal Navy’s ice patrol vessels have provided FIDS/BAS with invaluable support since the mid-1950s. This has mainly consisted of joint hydrographic survey work, air photography, and helicopter use for scientific field parties – opening up access to otherwise inaccessible locations. 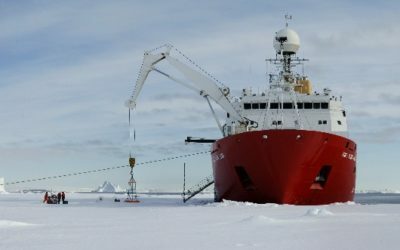 This collaboration continues to the present day with HMS Protector supporting BAS operations in 2015 by conducting survey work in the South Atlantic and the Antarctic Peninsula. A list of the ships and vessels operated by BAS and its predecessors is available as a pdf download. The British Antarctic Oral History Project includes interviews with members of the ships’ company, which provides insight into the daily life onboard ship.